Day in and day out, TriMet bus operators navigate 40-foot buses through the streets in and around Portland in all sorts of weather and traffic conditions. It takes skill, awareness and dedication. Soon our more than 1,000 bus operators will be putting their skills to the test and returning to the classroom as TriMet requires all bus operators to undergo an annual retraining and recertification process. This year’s training is set to begin on October 28th. 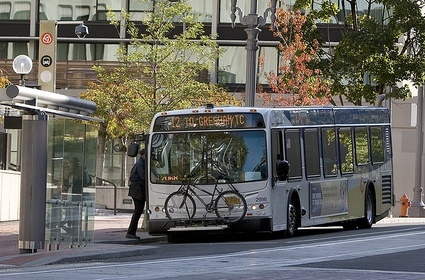 “TriMet’s core value is safety and it guides each decision we as an agency make, and it needs to guide each decision our operators make on the streets,” says TriMet Executive Director of Safety, Security and Environmental Services Harry Saporta. increase caution around pedestrians and cyclists. Trainers and fellow operators will accompany an operator on the road to evaluate his/her abilities and provide coaching. Each of our operators will then go through a driving skills assessment. The skills assessment is based on the same standards as the Oregon Commercial Driver’s License testing with additional elements unique to transit. In addition to the physical elements of scanning, operators will get training on identifying hazards and anticipating movements in order to reduce risks. The operators also get classroom training focused on safety as well as both the customer and the operators’ own well being. TriMet’s requirements and state laws prohibiting the use of electronic devices behind the wheel will be reinforced. Operators will be trained on watching out for distracted walkers who are caught up in their devices. The operators will be instructed on how to provide excellent customer service and follow all ADA requirements and best practices. They will learn how to recognize signs of personal fatigue, follow TriMet’s hours of service policy and the proper positions for the seat, pedal and steering wheel to maintain the best ergonomics while driving. The recertification process will also provide a great opportunity for operators to give managers feedback on the new TriMet Tickets mobile ticketing app, bus fare printers and the new bus communications system.